A book just by reading raises your level of consciousness. Have a read & write to let me know how you feel & your experiences of how you world view alters as you read in. I'd love to hear from you!! A society vibrates at a level around 200...Jesus around 10,000 - where do you feel you are at? 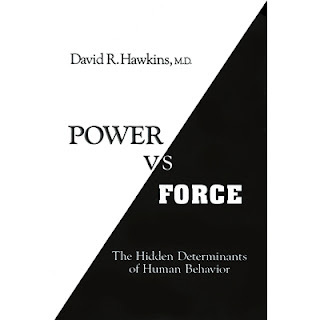 ﻿Awaited for twenty years, the publication of Power vs. Force by David R. Hawkins, M.D., Ph.D., reveals to the general public secret information heretofore only shared by the author with certain Nobelists and world leaders. Analyzing the basic nature of human thought and consciousness itself, the author makes available to everyone the key to penetrating the last barrier to the advancement of civilization and science and resolving the most crucial of all human dilemmas: how to instantly determine the truth or falsehood of any statement or supposed fact. This author's boyhood spiritual experience of the "Infinite Presence" has directed his life’s work as a healing psychiatrist, a healing that transcends his patients' physical world. Dr. Hawkins's basic thesis focuses on the "Ultimate Presence" – the source from which individuals can reach their highest potential. He uses theoretical concepts from particle physics, nonlinear dynamics, and chaos theory to support his study of human behavior. On the referenced Scale of the Levels of Consciousness, which calibrates the levels of Truth from 1 to 1,000, Power vs. Force calibrates at 850. “A beautiful gift of writing… (You) spread joy, love, and compassion through what you write. The fruit of these three is peace, as you know…” Mother Teresa, Templeton/Nobel Peace Prize recipient, anointed Blessed Teresa. “Perhaps the most important and significant book I’ve read in the past ten years.” Dr. Wayne W. Dyer, motivational speaker and prolific best-selling author.